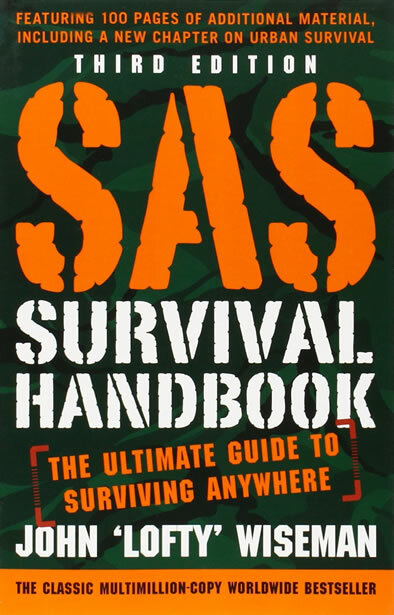 The SAS Survival Handbook is the definitive survivalists textbook for demonstrating the art of wilderness survival… And one of the most important survival guides in my library covering everything that you might need to know from building a fire, first aid and wild edibles to dealing with climate, navigation and personal shelters. Whether you are a novice, or a skilled survivalist, the colorful graphics, comprehensive descriptions and detailed howtos found in the SAS Survival Handbook are concise and very easy to follow as you learn to master the skills of preparedness and self reliance necessary to not only survive in the wild, but to thrive in any environment that you encounter. I own both versions of the book… The larger third edition is in my library at home, while a copy of the smaller and lighter 2E mini-guide is packed inside each of my EDCs and BOBs. Just make sure you pack a small flexible magnifying glass to read it. I use mine as a bookmark. I wholeheartedly recommend this book to anyone and everyone, no matter if you are a happy go lucky nut without a care in the world, or you are striving to be a wilderness guru or an urban jungle warrior preparing to survive the next catastrophic event, whether that be an earthquake, EMP, tornado, or one of a thousand other man-made or natural disasters. Learning and understanding the art of basic survival and mastering those skills can be all the difference that you need to survive the craziness out there.